Look What I Found! – He Said What?! Aaron went out to spend some time in the mulch this morning, relaxing as he so often does before we leave for his day group. I heard the door close as he went out through the garage, but soon the door came back open. Hmmm…..that’s unusual, I thought. I could hear Aaron’s heavy footsteps coming through the house and then his familiar thump, thump, thump up the stairs. He headed toward my room. “Mom! 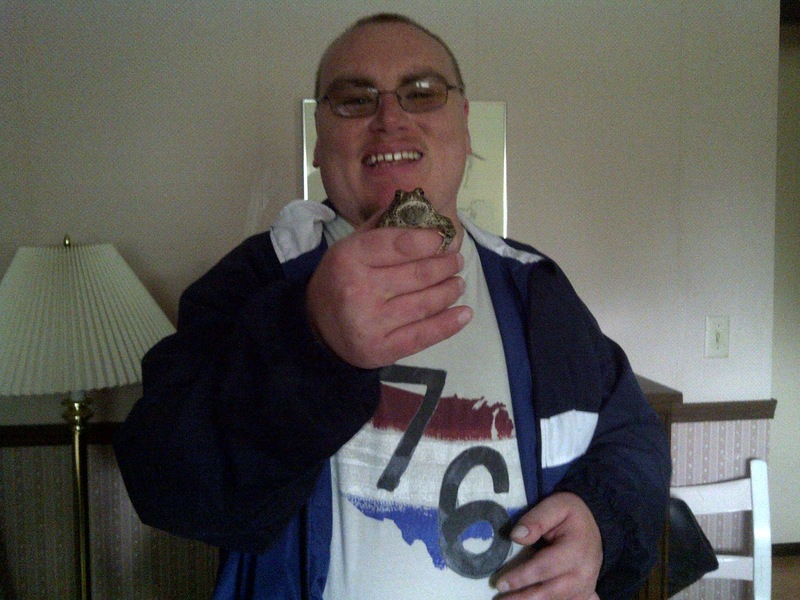 Look what I found!” And he barreled into the bathroom with a frog……or a toad, Aaron says……holding him up very proudly for me to see. Aaron and I have both seen the toad hopping in the front flower bed. I’ve told curious Aaron to leave the toad alone……that the toad is there to eat bugs…….that the toad will be scared to be captured and held…………all of which means nothing to Aaron. So he placed Mr. Toad in my sink and Mr. Toad promptly jumped out and landed on the open lid of my face powder. OK, Aaron. The toad is going to have to go outside. Aaron had toad pee on his hands and on his shorts, but that didn’t bother Aaron at all. He was very excited to have this “cute” toad in the house, in my bedroom and bathroom, and didn’t want to end the fun too soon. Of course, I told Aaron that I would take a picture to capture this special moment – and then he must take the poor toad back outside. Aaron held the squirming toad while I snapped these pictures, and the pitiful little guy starting squeaking. 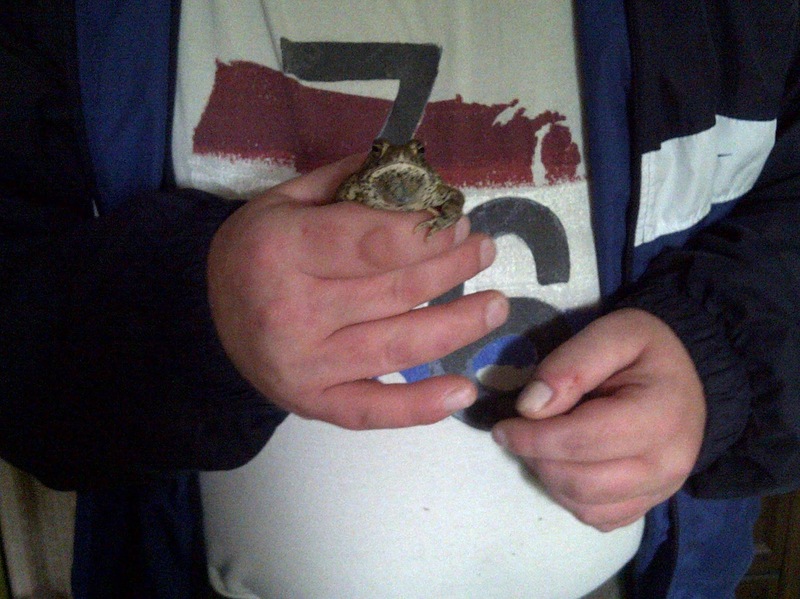 I haven’t often heard a squeaking toad…………neither had Aaron……….and so now Aaron was more fascinated than ever. Finally the photo session was over, Aaron put the little toad outside, and washed his hands. He put the toad back in his flower bed home. I wonder if the terrified toad has moved on to a new flower bed……..or a new house…….probably a whole new neighborhood! We may find out tomorrow morning when Aaron goes back outside. Poor toad! Poor me! Previous Previous post: "Oh It Rained, Rained, Rained……."